Happy Tuesday! I figured I’d stop in and share my latest obsession: Creamy Cheesy Dip/Spread (made in about 5 minutes with a blender). Seriously… I think I’ve made this dip about 5 times in the last month (3 times for social gatherings and 2 times just because I couldn’t stop thinking about it). I make it a little differently each time, but this way seems to be my favorite. And if you have these ingredients… how can you go wrong, really?! Three of my favorite things…. This is super easy to make and can be made with so many different flavor combinations… serve it with some sliced baguette, a good dip chip or some veggies… I’m also loving it as a spread on sandwiches. Sorry for the lack of photos… but I didn’t think that blended cheese would photograph well. 1 package cream cheese, softened. 2 tsp. onion powder or chives. Add all ingredients into food processor/blender–EXCEPT your cream cheese and lemon juice. Pulse until everything is chopped/well combined. Add in remaining ingredients and pulse for a few more minutes until everything is incorporated. Scrape into a bowl and cover. Refrigerate for an hour or so before serving–this allows the flavors to really come together. Want to add in some veggies? Throw in some broccoli, spinach or kale. This dip is real good. Please try it! Hope you all had a great weekend! Mine was a win for the most part. Saturday consisted of sleeping in, going shopping and having a giant lunch. I was pretty excited because I am finally creeping out of “in between sizes” and settling into the smaller size. I also picked up an awesome new t-shirt, along with some work pants and a sports bra. All were much needed! Sunday was my day off with Farmer Ben…and let me tell you, we both needed it! We started out with church, some napping (okay, I was the only one who napped…but who’s keeping track?) and an amazing lunch. As you know, I’m not big on boxed foods…but I have a serious weakness for Annie’s Mac and Cheese…especially with greek yogurt. So good! Sorry for the lack of photos… I was in too much of a hurry to stuff my face. Oops. Anyway, here is what I call “the Dirty Little Secret.” I justify it by telling the world that everything was local/from the garden except for the mac and cheese mix and olive oil. 1 box Annie’s Mac and Cheese-choose your own adventure on this one. Cook your pasta as directed on the box of mac and cheese (to save time, boil water while you are prepping the rest) and set aside. Reserve cheese packet for later. Roughly chop onion, jalapeno and garlic. Throw them in a hot pan with some olive oil. Cook until softened, stirring occasionally so they don’t burn/stick. Cook until your beef is browned, stirring occasionally to break up any big clumps. If necessary, drain out excess oils/fat (we used a 90/10 grass-fed beef, so there wasn’t really anything to drain). 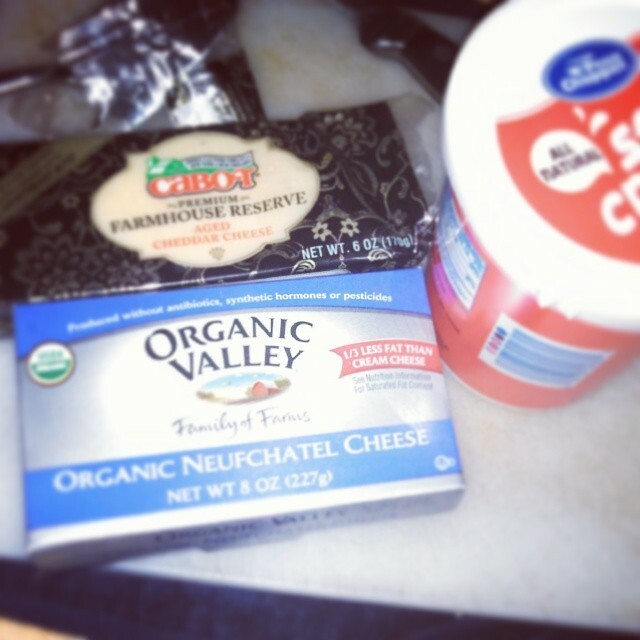 Add cooked macaroni and seasoning packet, along with some Greek yogurt…or sour cream if you’re feeling naughty. Stir until well combined. We ate our’s like this, BUT if you want even more crazy goodness, pour your beefy mac into a casserole dish and top with shredded cheese. Cover with foil, removing for the last few minutes of bake time. Bake in a preheated oven at 350 until cheese melts/begins to bubble-maybe 15-20 minutes. This will serve 4 people (better with a salad) or two extremely hungry people. We ate our’s in two sittings. Again, this is just a quickly thrown together option, you could add in bell peppers, diced tomatoes, olives, whatever you want! I am so sick of cookies. I am tired of sweets in general. I don’t know why, but this year, I really think I overdid it. I didn’t even do as much baking as I had planned but the thought of eating one more piece of fudge, slice of cake or bite of a cookie makes me want to run screaming for the hills. Seriously… I am going to turn into a chocolate chip cookie…or a stick of butter. Basically, I’m over it. That being said, I am probably the only person out there who chose yesterday, the day after Christmas, to do some serious baking. I know you’re judging. I am judging, too. But I had to do it! There are some very dear friends and family members who I had promised crazy confections… and I just… didn’t get around to it until yesterday, I mean, I had time the day before Christmas, but then the cookies would have sat around for days before I mailed them out, and who wants stale cookies? I certainly don’t. Anyway, I decided to jazz them up a little bit and make them a bit healthier (and more delicious-in my opinion-look for the recipe later this week! )…So, to the recipients of my baked goods, you’re welcome. After overdosing on sugar this month, my latest food obsession is the veggie pita. I take a whole wheat pita, slice it down the middle and stuff each side with mixed greens, sprouts, avocado, tomato, onion and Ben’s chili sauce. I forgot the chili sauce today, so I used hummus instead. I can tell that I have been going through clean food withdrawal because it feels so GOOD to be eating veggies, even if it is just the basic stuff. Side Note: Ben usually grows everything mentioned above (minus the avocado, obviously) in our garden-we still had scallions and Swiss chard growing up until a couple of weeks ago!- but, as it is the off season, we get most of our veggies at our local co-op, which works with local farms and greenhouses. I bought our tomatoes at Price Chopper- they were hydroponically grown in Vermont (and pesticide free! ), I chose these over the organically grown tomatoes from Mexico. I don’t pretend to be an expert about food and I don’t consider myself a “health-nut”, but as a personal policy, I do try to stick with all natural ingredients and buy local whenever possible. I also try to buy farmer-owned brands (such as Cabot or Organic Valley) and stick to items with ingredients I can pronounce. If I pick up a package that has a list of 40+ ingredients, I immediately put it down. I don’t believe that our bodies were meant to have so much junk put into them. When we buy meat, we get it directly from local farms, the farmers’ market or from our food co-op. Again, it’s not always “organic”, but it’s local, hormone-free and grass-fed, the way it should be. The same thing goes for our eggs. As far as microwaveable foods, I don’t. We don’t even own a microwave. I prefer to cook it, chop it, slice it, steam it or boil it myself…and if I make too much I can simply freeze it and reheat it on the stove or in the oven-or give it to a friend. I also avoid chain restaurants as much as possible, just because Ben and I have both worked in the restaurant business and know how much of the chain food comes in a bag and goes in the microwave. It’s gross…and ridiculous, considering how easy most of the food is to make. The idea of mass-produced foods (whether it be meat, cheese, bread or vegetables) kind of freaks me out…especially after some of the reading/documentary watching I’ve done. I believe that food is meant to be a personalized experience-not just eating whatever garbage is put in front of you-and that you’ll get more out of your meal if you know where it’s coming from and how it was prepared. It saddens me that so many people out there have no idea what they are putting in their bodies, day after day and even more have no idea how to cook for themselves! I am not saying that I am perfect. I do slip up on occasion, but for the most part, I try my hardest to follow these rules. I realize that it’s not super difficult for me as I was blessed with a wonderful mother who cooked a ton of different things and made me try new foods on a weekly basis (I didn’t grow up eating Kraft Macaroni and Cheese and Hamburger Helper, I grew up eating lentil soup, roast chicken, swiss chard, and countless other homemade things) …and I am married to a chef-slowly-turning-farmer-who-cans-freezes-everything. 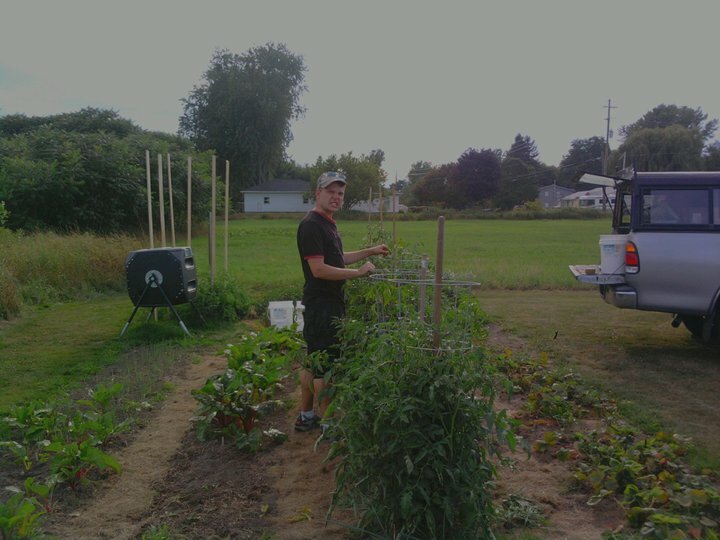 Farmer Ben, hard at work. I haven’t always been as passionate about where my food comes from… I used to stand with the many who see buying local/organic as pointless and too expensive. This simply isn’t true, you just have to do your homework. And honestly, if I spend a few cents more on my Cabot butter, I am okay with that, because I know that it is going to the farmers…or if I spend a little bit more buying the crackers with 7 ingredients instead of 47, I feel confident knowing that I am saving my body from a ton of extra junk it doesn’t need. Again, I am no expert, these are just my personal beliefs, but I like to think that I am healthier because of it. Anyway, that is the end of my rant for the day…who would have thought that talking about vegetables could get one so worked up?! With that in mind, I’m using this post as a public announcement. I am getting back on track-starting today! I am a big believer in the food journal. Even if you aren’t trying to get in shape, it’s really helpful to see exactly what you are eating-or not eating- and track your water intake. I know that this month I have been horrible about drinking water and I have felt it. So, I am getting back to my food journaling ways. I recently discovered MyFitnessPal and have been using it…kind of… for the last couple of months. I really like this site because it’s very comprehensive, has a really large and pretty accurate database and has a lot of different tools that I have found very helpful. They also have a smartphone app with a really awesome barcode scanner (probably the coolest thing ever!). Today, I am getting back into it after a brief hiatus and want to invite you to be …my fitness pal! You can find me-my username is nre820. Alright kids, catch you later! Be on the lookout for a few life updates and some baller recipes!